You can get a web site package from websites like basekit.com or 1and1.co.uk. They guide you on setting up pages and the style of the site.There is a few problems going this route, you will be locked into using their service and software and to update your site you will be logging into their server so you don’t have total control of your website and this will cost you allot in the long run. Get a free site packages from gettingirishbusinessonline.ie or WordPress.com, This can be a good way to get started but the packages are very limited when it comes to developing the site and again you have to login to their server. Get free open scour software uploaded to your server. 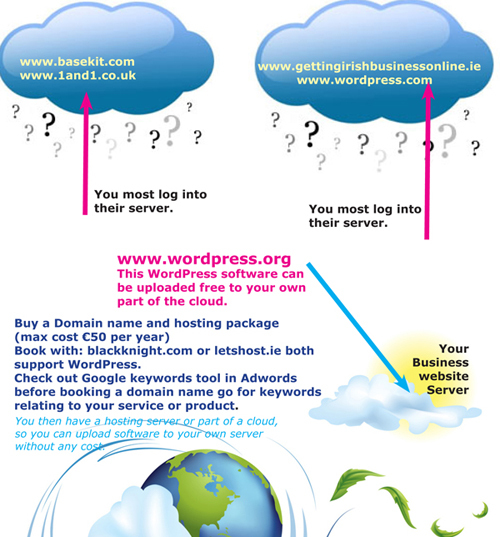 Own your own Domain name (You can book and check if the name is available with letshost.ie or blackknight.com). Get your own domain name and cloud hosting from Blackknight or Letshost they both supports WordPress.org (free open-source software). Get the WordPress.org software package uploaded to your site than you can create the site and update it easily. Having the WordPress software up on your website has great advantages. Not only because you have total access and editing control of the site, but the site can develop with your business and you can add shop cart, booking online, mobile pack, slide shows, keywords and more. What can we do to get you started on setting up a website? We can set up the WordPress software up on your hosting server. Design the main look and style for the site. Install the right extra software to make the site work for you. Train you on how to look after and updating the site. Get the best out of keywords optimisation and how to monitor the sites performance. We charge €50 per hour for training and two hours training would get you up and running, just email us at: info@webtrainingwicklow.com for more details or call us at: 01 2876689.